Public art in the East End is best recognized in the form of murals, and the East End is home to dozens of these colorful expressions. Created by local artists and students, mural art can be found on bus shelters, private businesses, schools, restaurants, and residences. The East End District had a hand in creating a number of murals, including bus shelter murals and ceramic tile murals in special partnerships with Metro and the Clorox Products Manufacturing Co., located on Armour Drive in the East End, along with local school children and artists. About the featured mural on this page: Artist Jesse Sifuentes, with Eastwood Academy students and faculty, created the tile mural located at 6635 Harrisburg Boulevard, where Mr. Harry Simon’s long-standing retail store, Simon Menswear, has been in business for three generations. 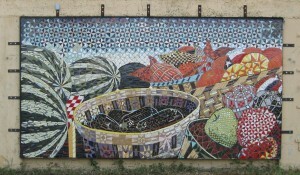 The mural, third in a series of murals at this location, is named Regalo de la Madre Tierra, and is made of 22,000 tile pieces that the Eastwood students helped set into place. The Clorox Company provided funds for the mural through a grant that links art and public education, enabling local students to participate in creating public art. More East End Public Art: The District’s Livable Centers area in Second Ward features public art in the form of functional pedestrian amenities, including solar lighting fixtures, benches, bicycle racks, trash receptacles, bus shelters, and signage. The Navigation Boulevard esplanade, developed with funding from an FTA ARRA grant and open to the public in fall, 2013, showcases this unique artwork. 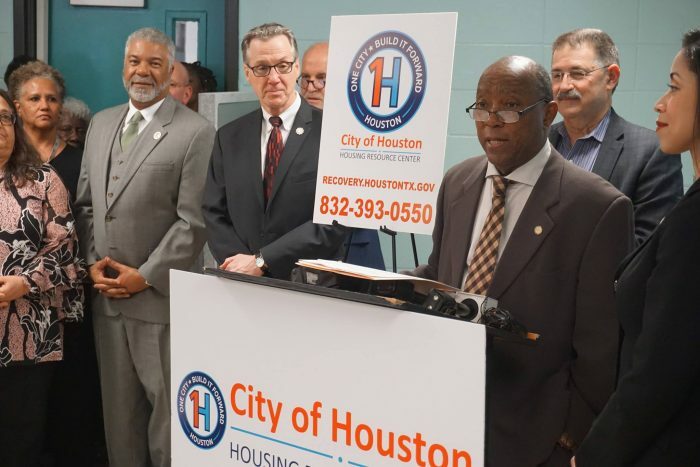 In December, 2011, the District was awarded a $100,000 grant from the City of Houston and the Houston Arts Alliance to be used for integrating art into Livable Centers as a transit oriented neighborhood.